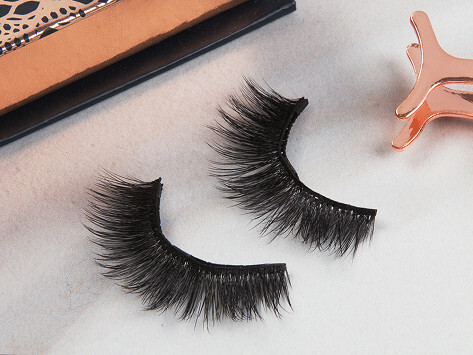 These silk magnetic eyelashes are easy to apply for a comfortable, long-lash look. Rest the top lashes on your natural lashes and line the bottom strip underneath, then the magnets will click in place. It takes just a little practice and the results are worth it. I love these lashes! Super easy click on's! Totally recommended!!!! Embolden your eyes in a snap. Putting on magnetic eyelashes is easy and intuitive. Once you get the hang of it, it’s a lot easier than applying traditional fake lashes. Unlike the old-fashioned kind—which you need to put on individual lashes with semi-permanent glue—these silk lashes have little magnets that snap together, sandwiching your natural lashes in between in one simple motion. Rest the top lashes on your natural ones, then align the bottom lashes just below. They’ll clip and stay in place. There’s a bit of a learning curve, but after a few tries, we got it just right. Each set lasts for 15-20 uses and comes with special tweezers that let you apply them all by yourself in seconds.